Acoustic Alchemy is a British contemporary instrumental and smooth jazz band formed in London, England in the early 1980s (c. 1981), originally fronted by acoustic guitarists Nick Webb and Simon James. The band is currently fronted by Greg Carmichael and Miles Gilderdale. During the 1980s, there was little grateful audience for this form of music in the UK, and the big players in the genre were all American. During the 1980s, there was little grateful audience for this form of music in the UK, and the big players in the genre were all American. The pioneering sound of two duelling acoustic guitars - Simon James on nylon and Nick Webb on steel - was a fresh touch on the genre, and hence the immediate success of the band, backed up by a double bass, percussion, and occasionally string quartet The Violettes. In the mid-1980s, James left the band; he would go on to form Kymaera, a similar, albeit more Latin oriented band. Webb then went on to discover Greg Carmichael, who became James' immediate successor. The new pair got work playing as an in-flight band on Virgin Atlantic flights to and from the United States - after sending some demo material to Nashville-based label MCA, the band was called six weeks later to record their first album. The pair had literally played their way to America, and in 1987 released their debut album, "Red Dust and Spanish Lace". The project saw them joining forces with other like-minded musicians such as Mario Argando?a on percussion and Bert Smaak on drums. The album was recorded at the Hansa Haus Studios, in Bonn, Germany. This was where they met sound engineer Klaus Genuit, who has worked on many of the band's albums. "Red Dust and Spanish Lace" was an instant hit - the first single, "Mr. Chow", fused aspects of Chinese music with reggae. Other songs, such as "The Stone Circle" still stand out as some of the band's finest work. Two more albums followed with MCA ? "Natural Elements" (1988) and the poppier "Blue Chip" (1989). Acoustic Alchemy were soon tempted away from MCA to the world's biggest jazz label, GRP Records. Six more albums followed, starting with the 9-track "Reference Point" (1990), featuring a cover of Dave Brubeck's classic, "Take Five". The track was the band's only cover to this day. The critically acclaimed "Back On The Case" (1991) followed, a ten-track collection which rivaled the innocent brilliance of the band's debut four years previous. For their eighth album, "Arcanum" (1996), the band decided to take a retrospective look back by re-recording some of the band's most popular tracks. The album was recorded in London's Pinewood Studios, along with the string section of The London Metropolitan Orchestra. The collection included three new tracks, "Columbia", "Something She Said" and "Chance Meeting", along with recreations of nine classics. "Positive Thinking" (1998) was to be Acoustic Alchemy's last album with original frontman Nick Webb. He was diagnosed with pancreatic cancer prior to starting work on it, and sadly got progressively worse throughout the project. In the end, he could only offer inspiration, as he was too weak to play at recording sessions. Nick Webb died on February 5, 1998. However, the album was perceived as one of the band's best. After Nick Webb's passing, Greg Carmichael decided to keep the band alive, but with big changes. He brought in understudy Miles Gilderdale as his playing partner, and the band moved label to EMI's Higher Octave, home of fellow guitarist Craig Chaquico, and popular synth trio 3rd Force. The debut album on the label, "The Beautiful Game" (2000) was dramatically different. New, stronger influences came from all sorts of genres, and it soon became clear that experimentation and diversity were to be a key element to the new band. 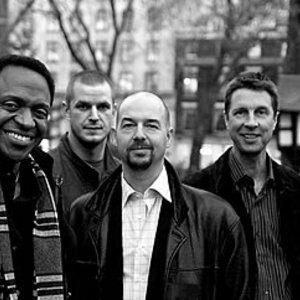 The band's latest release, "American/English" (2005), is an eleven track collection which further explores a wide range of varying genres, all with the signature Acoustic Alchemy feel. Early in 2006, bassist Frank Felix left the band, to concentrate on other projects. The band's manager, Stewart Coxhead, plans to keep the bassist's position fluid for the time being, although the band's British concerts this year have been taken on by former Incognito and Down to the Bone bassist, Julian Crampton. GRP decided to re-release a video of Acoustic Alchemy, originally on VHS, entitled "Best Kept Secret", on the 25th July 2006. It was re-released in Region 1 DVD format, and contained archived live performance and documentary footage, featuring Nick Webb. The Region 2 version is currently scheduled for release 7th August 2006.